In theory, I was in Prince Edward County last September to report a story about the incredible Pinot Noirs and Chardonnay made there, but a part of me was there for bagels. In theory, I was in Prince Edward County last September to report a story about the incredible Pinot Noirs and Chardonnay they make there, but a part of me—a very Saturday-morning-hungry part—was there for bagels. In researching this trip, I'd read about Henry Willis and his wood-fired Humble Bread. I'd been spying on his Instagram for a month and knew exactly where to find him. When I woke up that morning, it was wonderfully cold and crisp. I’d stayed at Janna and Duncan Edmund’s modern, home-y Edmund B&B in Bloomfield, in a room with orange-striped walls that made the room feel energized—an almost circus-tent vibe. Despite having had a massive bowl of granola, I high-tailed it off to the Wellington farmers' market in search of Henry, just as a storm started to move in over Lake Ontario. Unfortunately, the storm blew most of the market away, leaving some great pumpkins in sight—but no bagels. So I stalked the bagel guy. I tracked down his email address and invited myself over the next day. When I pulled into the gravel driveway at Henry Willis’s house, he was sitting at a table out in front of his big red barn wearing a bandana and bright orange headphones, sharpening a gigantic knife. He’d found the knife, he told me, in a nearby river and was shining it up for his friend Matt DeMille, the chef at the new Drake Devonshire hotel in town. He put the knife down and greeted me with a big smile and a hug. Inside the barn, Henry had built a massive wood-fired oven—ten feet wide and six feet deep—from which he produces unbelievably delicious things: sourdough baguettes, dense 100 percent rye loaves, all from naturally fermented doughs. What had started as a hobby (in a much smaller backyard oven in Toronto) quickly became an obsession, resulting in way more bread than Henry and Natalie, his wife and bakery partner, not to mention their neighbors and even lucky strangers, could ever take care of. "There was always a science experiment going in our home. One day Henry went online and googled: 'how to build a sourdough starter.' And suddenly there were 12 mason jars on our mantle with little stickers and a log book," Natalie recounted. Natalie poured bourbon lemonades while we waited for the bagels to come out of the oven. She and Henry had found this perfect property in Picton, Prince Edward County a few years before and moved, building out their barn and absorbing the rural life. Now they can’t keep up with the demand for their bread, which they sell weekly at the Wellington farmers' market and the Evergreen Brickworks Market in Toronto. In the winter, locals can place orders for bread and stop by the barn to pick them up on Saturday mornings. Henry unloaded six hot poppy-seed bagels from the oven, along with a cast-iron pan packed with thick-cut strips of local Nyman farm bacon. Natalie brought in a plate loaded with sliced golden, juicy heirloom tomatoes and opened up a little container of “Bagel Chevre” a tangier, fluffier goat's milk version of cream cheese—from nearby Fifth Town Dairy. 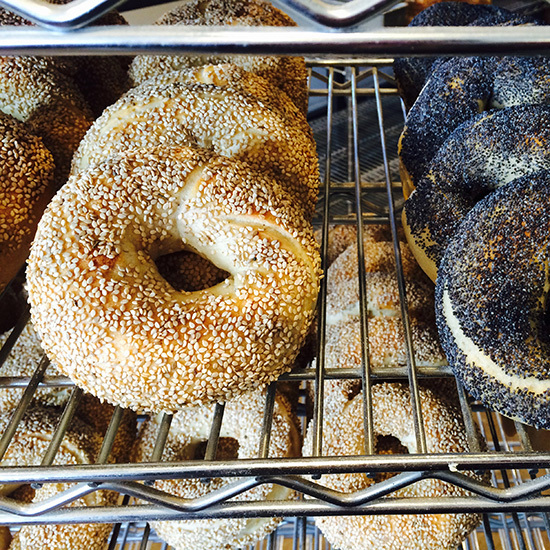 The bagels were crunchy and stretchy and flavorful, not the leaden dough balls that are often passed off as bagels. It was the sort of sandwich that you think about a year later; that you miss a little bit; that you’re certain you could never re-create. A stalk-worthy sort of thing.